In the powers-that-be battle for dominance on the evolving smart-home automation front, electronics giant Samsung took its opening shot across the driveway in August of 2014 with its acquisition of smart-hub vendor SmartThings. Earlier in 2014, mega-players Google and Apple also made their respective forays into the smart-home tech field: Google acquired smart thermostat pioneer Nest Labs, and Apple announced support for its iOS-only HomeKit integration platform. 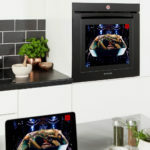 Smart-home automation in a box? The Samsung SmartThings Hub V2, released in late 2015, is connected to a home network through an Ethernet port. The hub also has an integrated battery backup feature and ports for support of future USB devices. All of these three largely-do-it-yourself platforms have been evolving and expanding their device support since then, but there are plenty of other players in the fray as all, including the likes of the Belkin WeMo environment, Iris by Lowe’s, the Wink hub, and many more. But Samsung made one of most notable recent advances in this genre of Internet of Things (IoT) technology with the launch of the SmartThings Hub V2 in September of 2015. 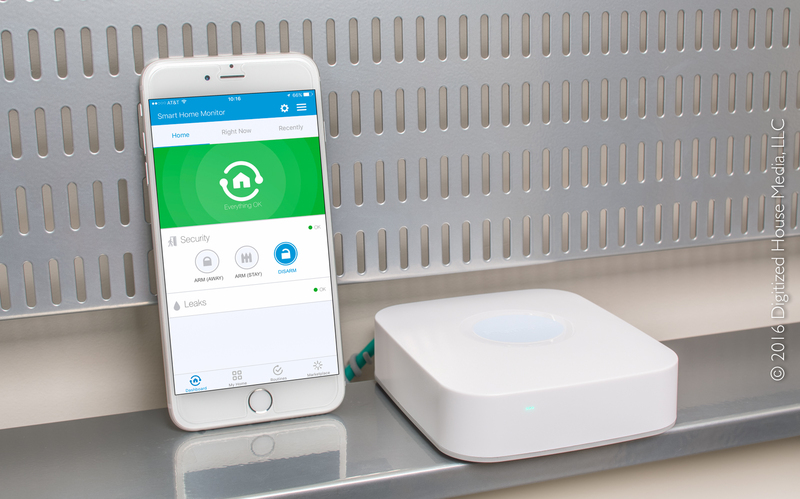 With support for the ZigBee, Z-Wave, and Bluetooth protocols—as well as the usual IP—the SmartThings Hub is a formidable power broker in a battle among DIY smart-home giants. The SmartThings-branded Water Leak Sensor (left) and diminutive Arrival Sensor (center) are easy-to-configure surrogates. Before we get into the details of the latest SmartThings Hub, it is worth noting the diversity of approaches these three big players are taking to smart-home automation. With SmartThings, the center of the universe is the standalone hub itself, a router-like device that must be plugged into the Ethernet network of the home. In addition to Samsung SmartThings-branded devices and sensors, many third-party products and sensors can connect through the hub’s support for the ZigBee, Z-Wave, and Bluetooth protocols, as well as the usual IP. By contrast, Google (or Alphabet) and its Nest Labs sibling take a distinctly different approach and simply require the installation of at least one Nest product—for example, the WiFi-connected Nest Thermostat or Nest Protect smoke detector—as the minimum prerequisite for integrating other devices into their automation ecosystem. Non-Nest devices and products can then connect in various ways with the platform after achieving certification through the Works with Nest program. And in the case of Apple HomeKit, the Apple side of the platform is pure software and does not require a dedicated in-home automation hub. HomeKit is integrated into the code base of iOS 8.1 or later and runs on compatible mobile devices, such as the iPhone and iPad. In order for third-party devices to connect, vendors need to certify their products through the Works with Apple HomeKit program; these devices will typically have an on-board HomeKit-compatible chip. For example, the iDevices Switch is one such product we have previously tested in our labs. We purchased our hub off the shelf at a local BestBuy store, at a cost of $99. The SmartThings Hub V2 is the first network router-type device we have seen with an integrated backup power supply: A set of 4 AA batteries installed in the bottom can continue to power the hub and process some alerts and automations in the event of a power outage. We would love to see router manufacturers take this approach with their products. Installation of the hub was exceedingly simple, though keep in mind access to power and an open Ethernet port are requirements. Once the hub was connected inside our mechanical room, we used version 2.1.0 of the SmartThings Mobile app for iOS (the app is also available for Android, plus Windows 8.1 and 10 devices) to complete the setup process for our Digitized House Zero Energy Living Lab home. A few days after we activated our system, SmartThings automatically pushed out a hub firmware update to version 000.014.00032. With this latest iteration of the app, main navigation is enabled through four icons in a dock at the bottom of the screen, including Dashboard, My Home, Routines, and Marketplace. At launch of the SmartThings Mobile iOS app, the Dashboard appears with the Smart Home Monitor. One can assemble a holistic DIY home-front security system on this panel, replete with standard Arm (Away), Arm (Stay), and Disarm buttons. Dashboard becomes the home page when the app launches, and this comprehensive Smart Home Monitor feature provides an at-a-glance status report for security intrusion, fire, carbon monoxide, water leaks, and info from other key sensors. One can use Dashboard to assemble a holistic do-it-yourself (DIY) home-front security system, replete with standard Arm (Away), Arm (Stay), and Disarm buttons. Accessed from the My Home button, the Rooms panel can include any number of user-definable rooms or areas per home location. Tapping a room reveals all of the devices and sensors associated with that room. The My Home button gives access to the Rooms, Things, and Family tabs. Rooms are specific to each location, and can include any number of associated devices and sensors—each with a typically-clickable status indicator. Things are the essence of SmartThings, and includes the individual devices and sensors that have been added to the location and activated. Family is an at-a-glance status page for various location sensors that report their status as absent or present at the location, including devices such as the SmartThings Arrival Sensor that can, for example, be attached to a child’s backpack and then trigger notifications as the sensor arrives or departs. Smartphones running the SmartThings app can also be added as location sensors with no additional hardware. Out of the box, SmartThings is pre-configured with four clickable recipes called Routines, including Good Morning, Good Night, Goodbye, and I’m Back. Additional Routines can be created for desired home usage models or events. Routines are groupings of user-configurable device automation recipes for time-of-day, arrival, departure, or on-demand events. These recipes can include actions related to lights, switches, and dimmers, plus locking and unlocking doors, opening or closing garage doors, adjusting thermostats, arming or disarming the Smart Home Monitor, and setting the Away, Home, or Night modes. Marketplace provides access for adding new Things and SmartApps. For adding new Things, a series of hierarchical menus enable adding a diverse array of new devices and sensors that can be located throughout the home. For example, under the Climate Control menu, selecting Vents> Keen Home enables adding the Keen Home Smart Vent, and also gives direct access to device-specific documentation and support. We can only wish other apps were as friendly. The Notifications pane includes an integrated text-messaging-like Messages feature for delivery of activity notifications. SmartThings can also be configured to concurrently deliver the same notifications through conventional text messaging apps. One of the most powerful features of the SmartThings platform is SmartApps—applets that can perform specific actions for devices and sensors based on internal and external events. For example, the Dashboard’s Smart Home Monitor is itself a SmartApp, but there are many more under constant development from the SmartApps team as well as from developers in the community. A new hamburger menu at the top right facilitates setting up additional SmartThings home locations, plus access to Notifications—a dual-purpose pane with a text-messaging-like Messages feature and a detailed Activity Feed. Things are the essence of SmartThings, and consists of the individual devices and sensors that have been added to the system. On this panel, each installed Thing is accompanied by a status indicator on the right that is updated in real time. For this initial testing exercise, we purchased the following Samsung SmartThings-branded devices: Arrival Sensor, Multipurpose Sensor, and Water Leak Sensor. Each of these native sensors were simple to add to our system, and worked flawlessly, instantly reporting their status changes as instructed to the SmartThings app and generating alerts according to how we configured them. The Arrival Sensor is a small, key-fob-sized device that can keep track of the comings and goings of people, pets, cars, and most any other potentially-mobile object. An upside when the sensor is attached to a keychain: the SmartThings app can be used to trigger a beeping tone to help you track down misplaced keys. The Multipurpose Sensor—a two-piece ZigBee device primarily designed as a door, window, or garage door open/close sensor—is multi-talented and can also detect vibration, orientation, and temperature. The temperature sensor component, for example, can be independently selected in a SmartApp to trigger an action while the open/close component is configured in a separate SmartApp. Similarly, the primary role of the Water Leak Sensor is of course detection of water through the exposed metal contacts on its underside, but it also has an onboard temperature sensor component that can be independently selected for monitoring. Support for third-party devices and products is exceedingly deep in the SmartThings platform, including out-of-the-box support for the popular Sonos wireless music system. We were delighted to discover that we could integrate our existing Sonos wireless music system into SmartThings without adding any special hardware. Through the Marketplace pane, we selected Things> Entertainment> Speakers> Sonos> Sonos (Labs) to discover all four sets of Sonos speakers in the home. In order to control the speakers from the SmartThings app, we installed the Speaker Control SmartApp. Going deeper, we installed the Mood Music SmartApp, which can enable playing a specific song or station based on virtually any detectable event in SmartThings. For example, based on the arrival of a specific Arrival Sensor, one can play a specific track in a specific room. We also successfully connected GE Link LED lamps to our system, as well as a Belkin WeMo Insight Switch. Both worked instantly and flawlessly in our testing. We were impressed by the deep support for devices and sensors beyond the handful of Samsung SmartThings-branded products, a much more extensive collection as compared to what is currently available through the competing Google/Nest or Apple HomeKit platforms. This level of third-party SmartThings support is largely due to the hub’s support of multiple protocols. Generally, things worked as one would expect them to, though occasionally we noticed the SmartThings app would not properly report the status of a device (in particular, whether a specific Sonos speaker set was playing or paused). But overall, we think SmartThings is an excellent platform and we see a bright future for it. Samsung states on their website there are over 200 connectable devices, and we would not doubt that figure. Samsung has also announced SmartThings support for their line of 2016 Smart TVs as well as integrating IoT hubs into their 2016 SUHD TVs. We will delve into that set of integrations in a future article. Certainly, each of the smart-home platforms are embroiled in constant states of change, with device and sensor support rapidly advancing, yet as one would expect there continues to be minimal integration between them. This tendency toward closed ecosystems should relax somewhat going forward as the software layers and communications protocols get smarter and more universally adopted. Google and Nest, for example, are continuing to solicit support for their behind-the-scenes software layers, the Nest Weave application protocol, as well as Thread, the accompanying networking protocol designed for the expected mesh networks in the world of IoT. But currently, there is no native support for Thread in SmartThings, so the three Nest thermostats and two Nest Protects we have in our lab home essentially exist in their own virtually-networked world. Stay tuned. The smart-home journey is sure to be a thrilling ride.